India, October 12th 2016 — Launched on August 17th 2016 at the Zenvolution India event, the stunning Zenfone 3 Laser will now be available in the country. 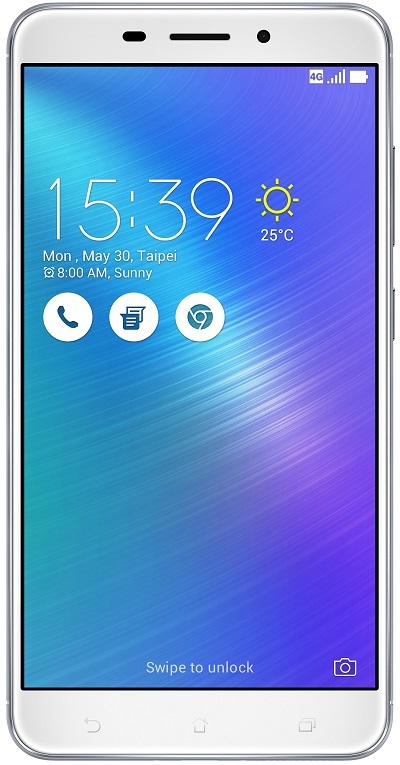 The Zenfone 3 Laser is ASUS’ latest offering from the Zenfone 3 range that offers high-end specifications at an affordable price tag – starting at INR 18,999. The smartphone will initially be available on Flipkart for a month. Post that, it will also be available on other leading e-commerce sites and in leading retail stores & Asus Exclusive Stores across India. The true test of any smartphone lies in the overall performance. Considering that, the Zenfone 3 Laser is a perfect choice for any gadget lover. With its massive 4GB RAM, multitasking becomes easier, and running heavy applications is a breeze. A Snapdragon octa-core 64-bit processor, along with the 4GB RAM, offers more than adequate performance levels for any consumer. Not limited to this, the Zenfone 3 Laser also has a 3000 mAh battery, that lasts long enough for even the most elaborate user. Not just processing power, a good camera has become the need of the hour. The Zenfone 3 Laser, is the perfect device for the photographer in anyone. With a 13MP/8MP (rear + front) camera, the Zenfone 3 Laser has the next generation PixelMaster 3.0 with a 13MP sensor, large f/2.0-aperture lens and 0.03 seconds laser auto-focus. It also has the capability for electronic image stabilization (EIS) to create blur-free videos. The second generation laser focus system on the phone, has a range of 1.5 meters, which is twice the distance of other laser focus systems. The phone is also equipped with a color correction sensor that automatically adjusts the resulting colors in the photograph, making it look absolutely stunning and natural. Along with all these high-end features, the premium design of the Zenfone 3 Laser is elegant. Its finely sandblasted aluminum body with rounded sides is perfectly enhanced by diamond-cut chamfered edges. This results in a luxurious looking product to please even the most artistic eye. This carefully crafted design lends the smartphone a sophisticated look, while maintaining its durability and comfort. When it comes to the display, the Zenfone 3 Laser has a 5.5-inch, full HD (1920 x 1080) IPS panel, which makes it the ideal device for any multimedia usage. The display also has a special feature – a ‘Bluelight filter’ which, when activated, reduces blue light emissions by up to 30%, thereby reducing eye fatigue. This becomes especially useful during long sessions of gaming or reading. The phone also has a rear-mounted fingerprint sensor, which allows for quick and convenient 0.3-second unlocking and authentication, with the capacity for registering up to five different fingerprints. Available in exciting colors like Glacier Silver and Sand Gold, the Zenfone 3 Laser comes at an affordable price, starting at INR 18,999. Slim bezel (2.58mm) and 77% Screen to Body ratio. Evernote Announces Evernote Business – Consumer Service For SMBs! Sennheiser Top 50 Is Back And Its Bigger, Wilder And Louder!